Our industry is always changing. Sometimes it can feel hard to make sense of all the information and opinions out there. Welcome to “Let’s Talk,” our latest effort to help you feel educated and empowered about working on the web. Here, we’ll share articles we’ve written and resources we’ve found helpful. 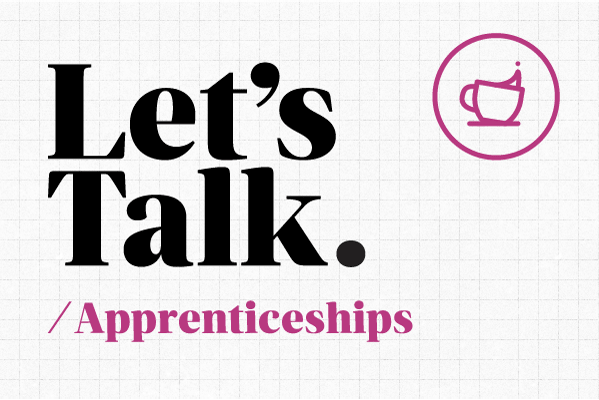 In our second issue of “Let’s Talk,” we’re tackling apprenticeships. What is a web industry apprenticeship and should you pursue one? How is an apprenticeship different than an internship or entry-level job? Why did we start the apprenticeship program at Sparkbox and how has it improved our team and our work? We’ll be tackling a new topic a few times a year in the “Let’s Talk” series and are always interested in your feedback. Reach out and let us know your thoughts. What do you want to see us talk about next? In this post, Drew explains the origins of our apprenticeship program, writing that it was our VP Rob Harr who “painted a picture of a long-term, in-house training where upcoming web developers were compensated, allowed to focus on learning, and surrounded with good direction and feedback.” In other words, we established an apprenticeship program for emerging fullstack developers and frontend designers because we want to grow talent, not just consume it. And grow talent, we have. College can be a great time for learning, but not always the things you need to know to succeed in the professional world. In this post, Kasey shares what she learned as a Sparkbox apprentice that she didn’t pick up on in school. You may be surprised—it’s not just technical skills but also important workplace dynamics, such as how to work on a team, work with clients, and not get overwhelmed. An important takeaway Kasey emphasizes is that learning doesn’t end with graduation. It’s a lifelong process. This personal post by Heather demonstrates the power of the right apprenticeship. She explains how she always wanted to find a way to combine her love of art, math, and science but was unsure of how she’d make a career in design when she couldn’t even draw a straight line. Heather chronicles her path from psychology student to visual designer to frontend developer and explains how Sparkbox’s apprenticeship program helped give her the skills and confidence to bring beautiful designs to life through code. “Follow your passions, never stop learning, and never stop dreaming,” Heather advises.